To go with the feijoada I posted about last, I wanted a light(ish) and more refined starter. Most of the food I cook is very far from refined, let’s face it, and the Afro-Brazilian dishes I enjoy the most tend to be hearty and robust. 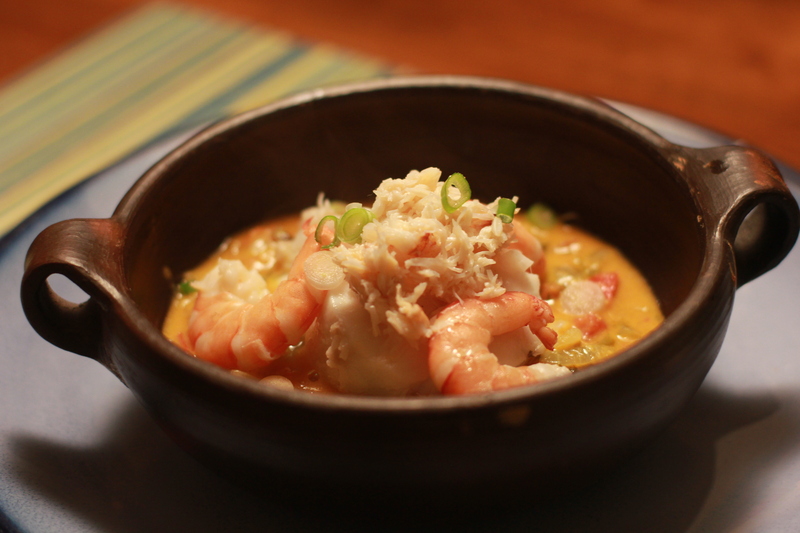 But I thought moqueca, the Bahian coconut-based fish and seafood stew, might be open to a bit of refinement. I know there are many different variants of moqueca in Brazil but the kind I’m most familiar with is from Bahia in the North and mixes indigenous with African flavours. 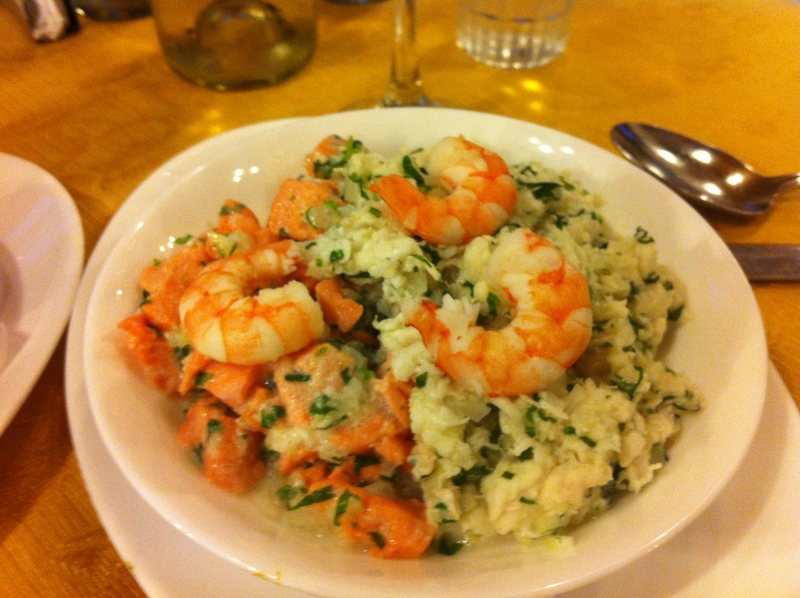 I had it when I was in Brazil – although I was in Rio de Janeiro, so I’m sure my Bahian friends will scoff at its authenticity – and it was a truly enormous pan heaped with all manner of seafood, swimming in a spicy lake of coconut broth and with orange dendê oil lapping around the edges. It was a bowl to be reckoned with and as I recall two hungry people could hardly make a dent in it. 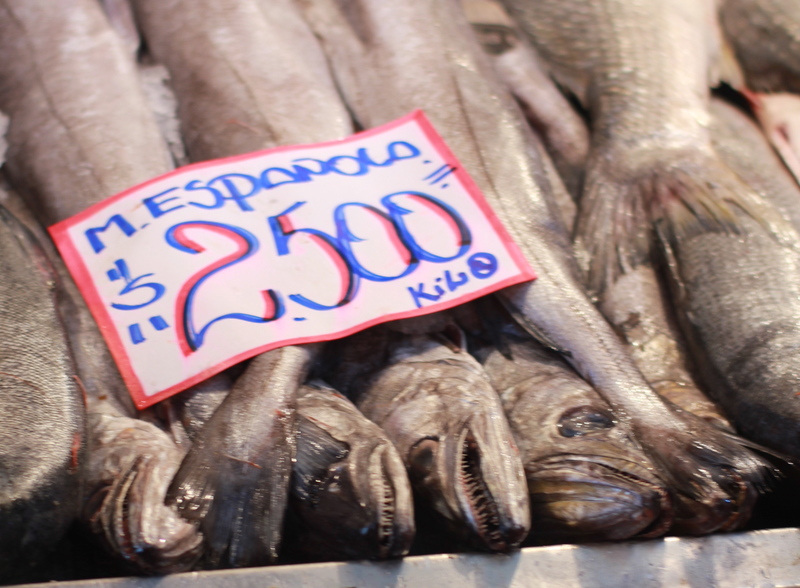 Santiago central market was, as they say in the UK, a game of two halves. 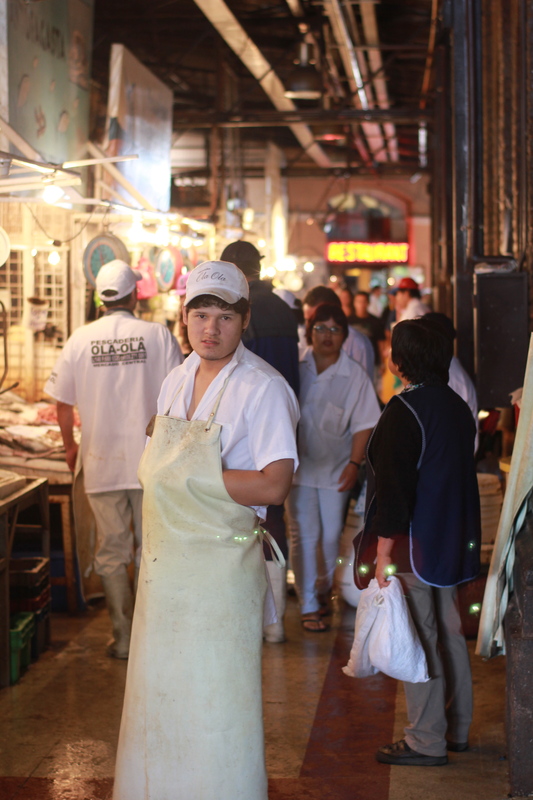 We had planned to check out the market in the early afternoon so that we could wander the fresh fish and vegetable sections for a while and then eat lunch among the stalls. I had visions of little food vendors perched among the stalls, perhaps one specialising in empanadas, another in fish dishes, and so on. Anthony Bourdain had visited this market and he seemed to like it, so I was pretty optimistic about the kind of unpretentious food I’d find there. This fantasy was sadly not sustained by the reality. The restaurant section of the market immediately felt like the worst kind of tourist trap, in which dozens of red-uniformed restaurant operatives descended on us and started in on a hard sell in both Spanish and English. 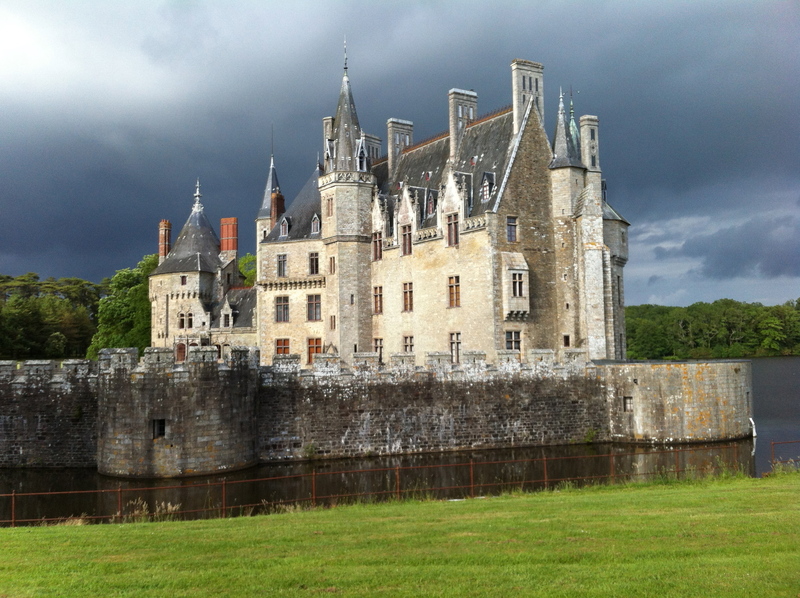 We resisted for a while but eventually decided we may as well pick a place for lunch. As we foolishly hesitated among identical looking options, one operative told us we should come to his restaurant because Obama just ate there on his recent visit to Chile. Naked appeal to tourists he took to be North American? Definitely. True? Maybe, maybe not. But we laughed and figured it was as good a line as we were going to get at that point. The experience was what you might predict in these circumstances: decent, fresh seafood, hideously overpriced, with service so attentive as to feel unpleasantly like surveillance. I ordered large shrimp fried in garlic and got all of three shrimp for my £10. Three! Lucky I wasn’t too hungry. The waiter seemed annoyed that we didn’t order more but the whole thing was uncomfortable enough that we didn’t really care. 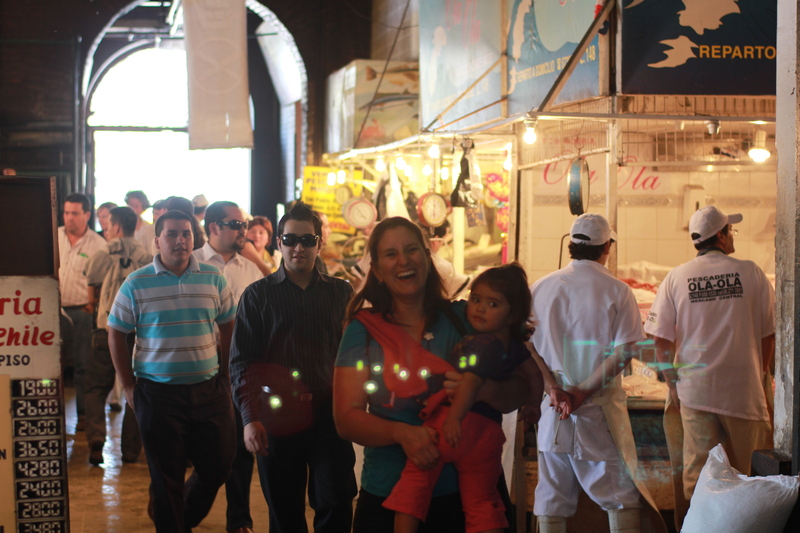 So, eating at the Santiago market is not recommended but the market itself was a whole other story. 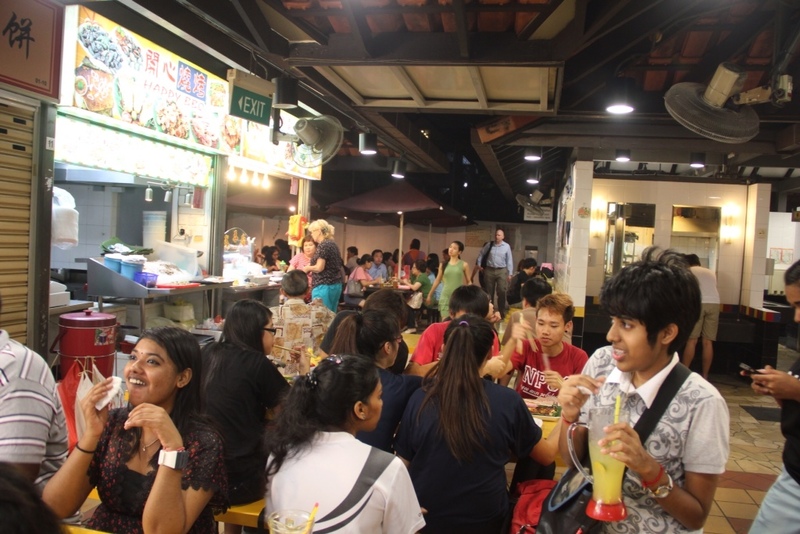 As the smiling woman in the picture above suggests, meandering among the fish stalls was a joy. Everything is laid out beautifully and you can get sucked into watching the workers expertly gut and fillet fish with amazing speed. Everyone who works in the market section is friendly; eager to sell you some fish, to be sure, but just as happy to chat about the produce or, like this guy, to pose for a few photos. It’s also rather nice to see all the foods we’ve been eating for the last week or so in their raw form. 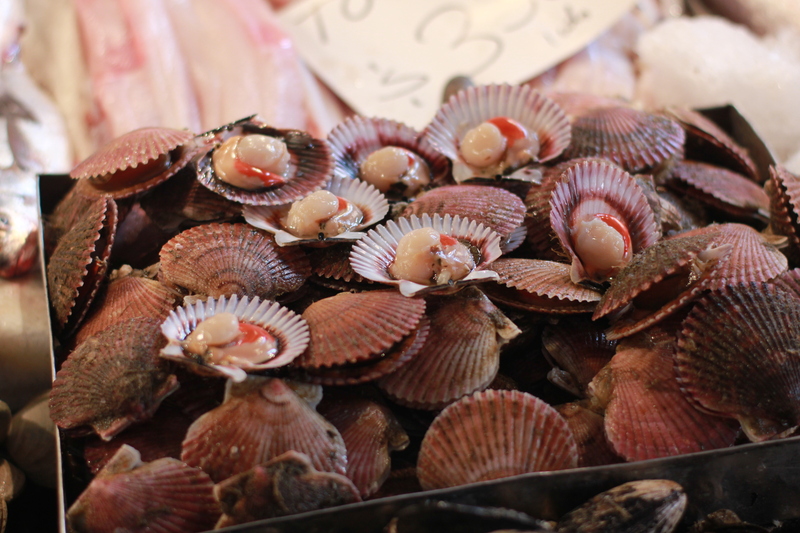 The stallholder in charge of these scallops tapped them repeatedly to show us they were alive and healthy. Not alive but still pretty fresh were the congrios of various colours along with lots of other fishes I didn’t recognise. 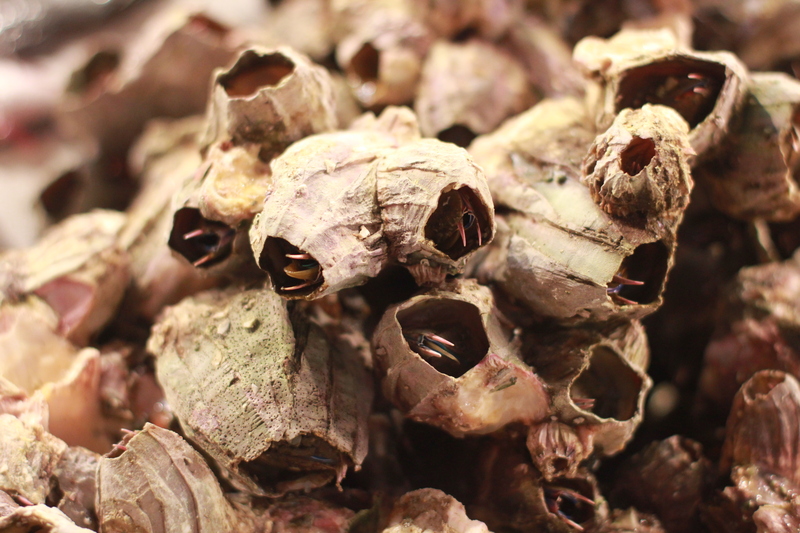 And finally comes the freakiest of seafoods: picorocos or giant edible barnacles. These creatures exert a queasy fascination, what with their giant claws (or are they – shudder – teeth?) peering out of their rocky shells and, worse, some kind of yellow tongue that emerges from between the pincers if they smell your proximity. They look a lot like the Alien, especially when the pincers open up and the tongue thing comes out. As you watch, they wave about, sniffing the air for prey. They’re completely abject and I could have stared at them for hours. Apparently they are cooked in the shell/rock and you eat them by grabbing the claws/teeth and using them to pull the whole thing out. All I have to say is that I’m willing to bet you any money that Obama didn’t eat those when he was here. I’m starting to feel a bit guilty that I’m not posting any recipes. New readers might imagine I spend my life swanning about the world eating in restaurants. I promise I’ll get back to cooking when I go home next week, but for now, it is all about the eating. And, at the risk of repetition, I have to say the eating is fabulous. On our last night in Chiloé we wanted to have curanto, the regional specialty. Curanto properly made is a bit like a New England clam bake: shellfish, meat, potatoes and vegetables buried underground, lined in leaves, and cooked under hot stones. All over the island you see signs for “Curanto in hoyo”. We had seen signs for curanto in the restaurants behind the fish market and this seemed like an excellent bet for the evening. However, when we went back at night the whole area was deserted and frankly a bit sketchy looking, and the restaurants were all closed. Clearly, they catered to the market workers and closed after lunch. Feeling a bit despondent, we made our way to the place the man in the hotel had suggested. We weren’t too optimistic, as he had steered us to the mediocre place the night before, plus he seemed to imagine hotel guests must want to eat at the swankiest places in town which wasn’t really the case for us. 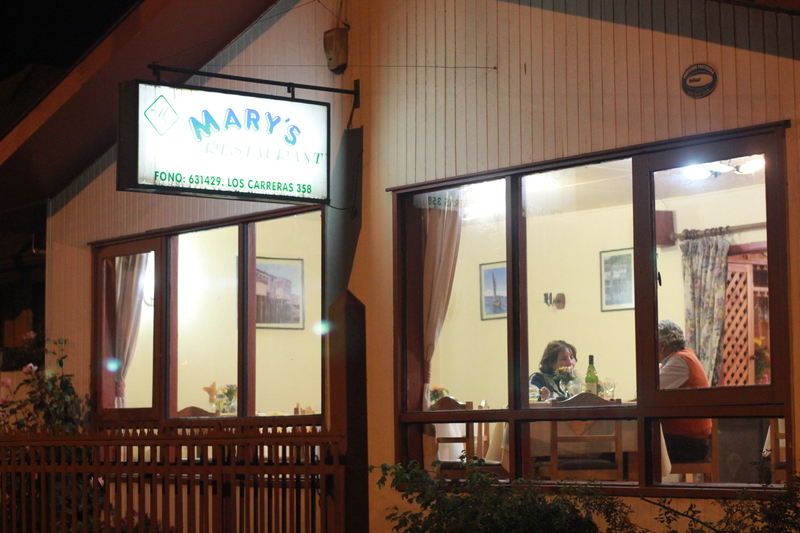 But as soon as we saw the exterior of Mary’s restaurant, we had an inkling that this might be a much different experience. Doesn’t this just look like a place that will serve exciting food? When we went in, we were offered the front room (in the picture) or the cosier back room. We picked the back, only to realise that all the customers in back were men. Up front were couples having a nice night out, while in back were tables entirely of men. Hmm. Oh well, we were obviously gringos so we decided to tough it out as the men gave us Paddington Bear Hard Stares. Sadly, they could only do curanto with a full day’s notice but they did offer us pulmay, which is curanto cooked in a pot. 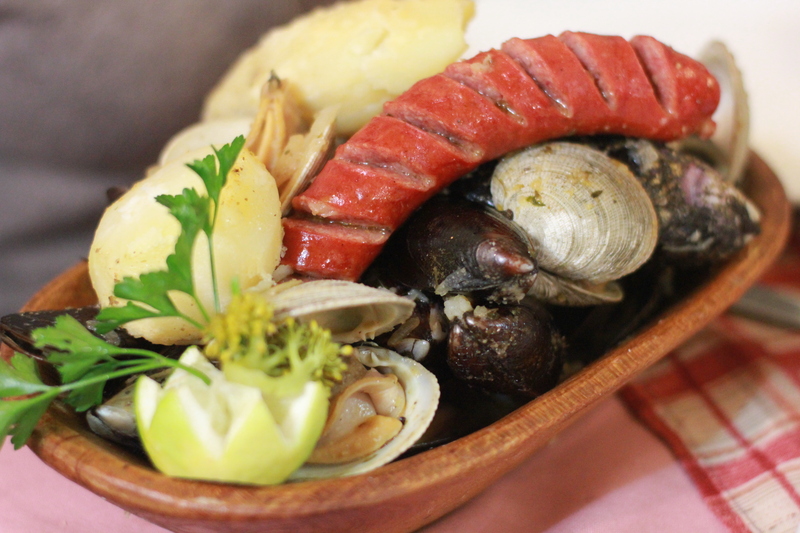 What arrived was the obscene looking dish above: a sizable wooden trough filled with giant mussels, regular mussels, clams, a longaniza sausage, and potatoes. On the side came a bowl of spectacular dipping gravy, a rich broth of fish bones and crustacean shells and given a welcome kick with red ají chilies and cilantro. 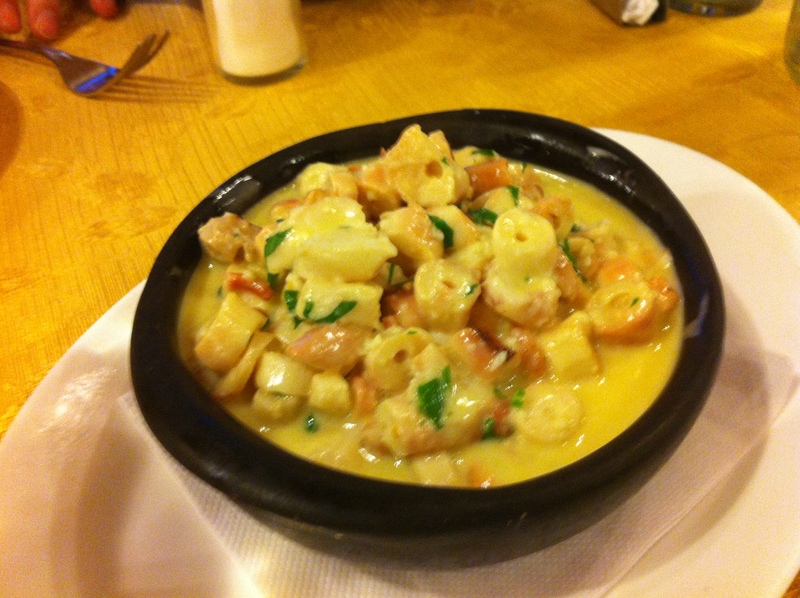 It looks quite plain but it was one of the tastiest dishes I’ve had in Chile. Some of the lemurs pronounced it even better than the seafood-palooza from Puerto Varas. That’s fighting talk, but it gives an idea of the richness of the broth. It also came with home-made ají sauce, which was smoky and so delicious we asked Mary for the recipe. She insisted it was just ají, cilantro and vinegar, so the chilies must be really good in Chiloé. 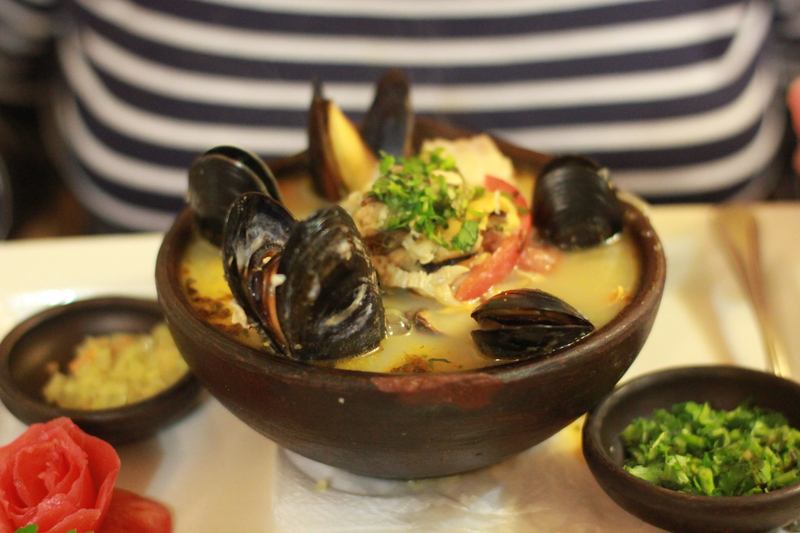 Mama Lemur had a sopa de mariscos that was equally wonderful, made from congrio, mussels and clams and with a less spicy but no less deeply flavoured broth. 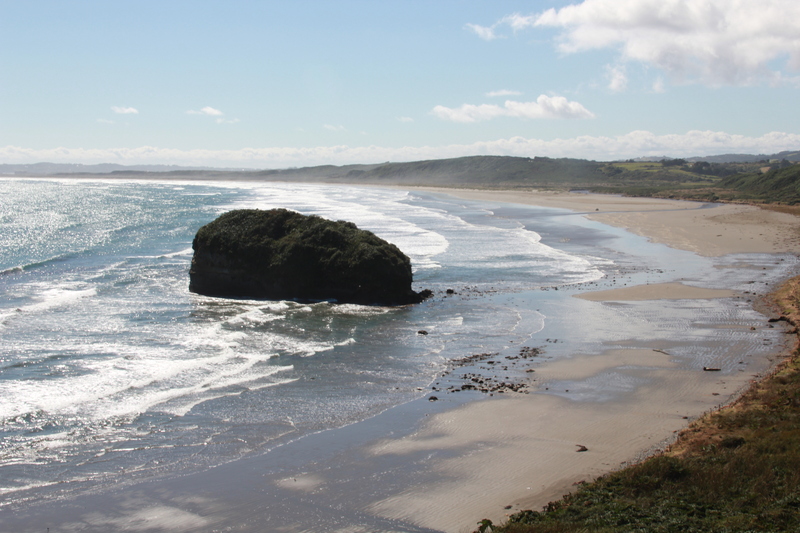 And, lest it be suggested that all I did in Chiloé was eat, here’s a nice picture of a beach we went to on one of our drives around the island. I’m never going to eat again. Ok, that’s a lie, I’m probably going to do much the same thing today as I did yesterday, but it feels like I ate more seafood than is entirely reasonable. But let’s backtrack a little. 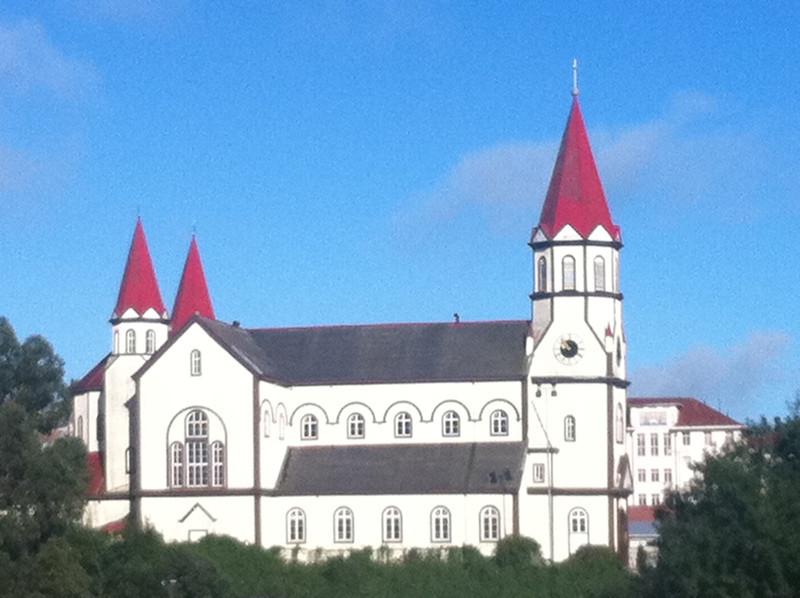 Yesterday morning we arrived in Puerto Varas after a twelve-hour bus journey south from Santiago. It sounds arduous but was actually very civilized – comfy seats that recline into beds, blankets, pillows and attentive staff made it feel more like a train than a bus. For dinner, we went to La Olla, which had been recommended by several sources including the nice lady in the hotel and Chowhound. We knew immediately we were in good hands as the parking lot smelled overwhelmingly of fresh seafood and garlic. The interior was what I’d characterize as rural fancy: yellow tablecloths, dessert display and a laid back atmosphere. 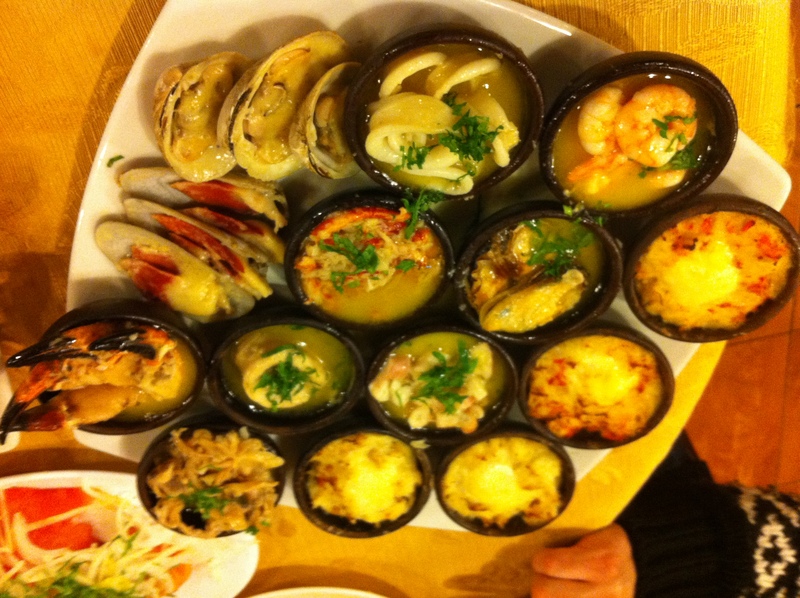 We ordered what we thought was a regular amount of food – appetizers to share and two hot seafood platters among three for entrees. The prices suggested that this was fairly normal with mains costing under 10 GBP or $15 each. And thus began the seafood-palooza. First up, the appetizers. A Caribbean ceviche arrived in a large soup bowl full of shredded conger eel, salmon and shrimp with a light mix of aji, cilantro and lime. The eel was unimaginable delicious and the whole thing was fresh and tasty. It was also kind of a bucket of ceviche. Next came octopus in garlic sauce, which was warm and full of buttery, garlicky goodness. Also generously proportioned. So, after all that, we were kind of full but we had no idea of the onslaught to come. Finally came the picada caliente x2. 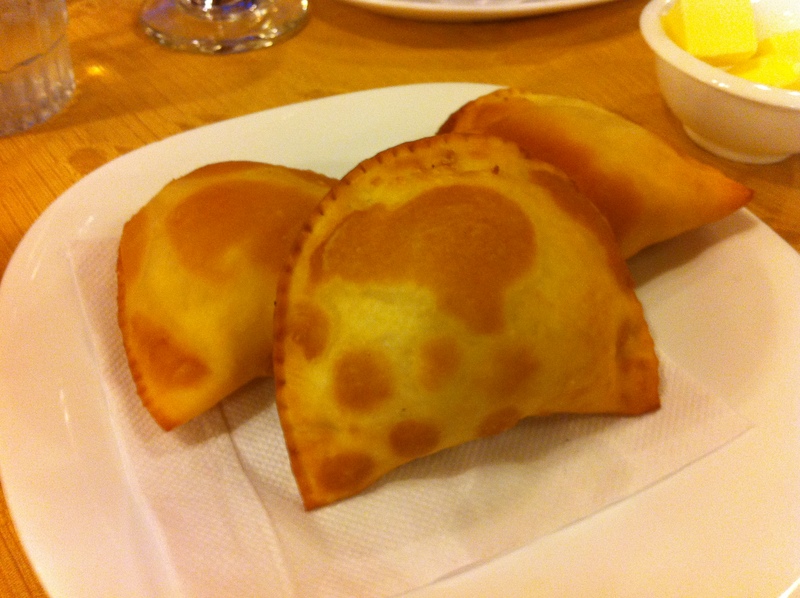 Now picada doesn’t sound like a lot of food but just look at what came to our groaning table! We had machas with parmesan, clams in their shells, whole crab claws, squid, shrimp, crab meat au gratin, crab meat in little mini shepherd’s pies, abalone, octopus, crab claw pieces in butter, mussels, and a big pile of some kind of clam I didn’t recognize but which was deeply savoury and good. The whole thing was monstrous, decadent, and very very good. We didn’t come close to finishing it, which was tragic really, but now we come prepared. 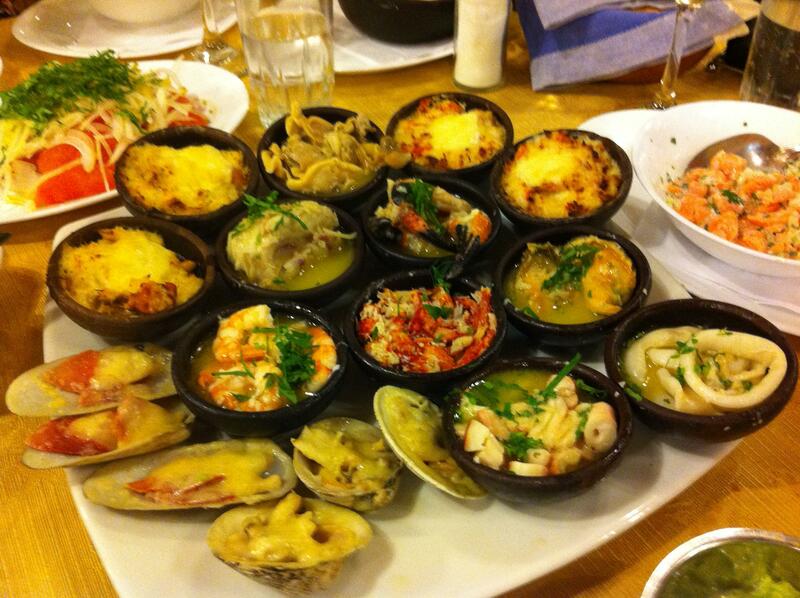 Next time, no lunch, no appetizers, just us against the seafood.